In a way this was inevitable, wasn't it? 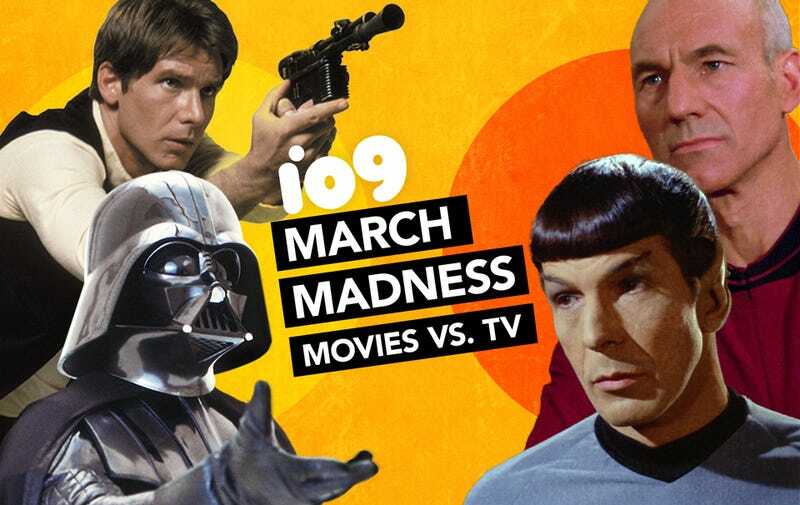 As we moved closer and closer to the finals, it became clear that everything else was just distractions from another chapter in a debate that's raged for decades: Star Wars vs. Star Trek. Look, y'all can be honest with me. We're all friends here. In the last round, it didn't matter who the other choices were — you were voting for this showdown, right? That's not entirely fair. The movies round was actually pretty close. Star Wars only beat Marvel by 247 votes. That's the closest battle Star Wars has had all tournament — it fairly crushed everything else up until Final Four round. It always beat its competitors by at least 25 percentage points, going 80 - 20, 75 - 25, 80 - 20, 66 - 33. That's in comparison to Star Trek defeating Doctor Who by 1,353 votes. While its sister competitor over on the movie half of the bracket was knocked out by Marvel, the TV side of Star Trek sailed through the competition. Its closest battle was Game of Thrones — which The Lord of the Rings beat last year to get its place in the final. So now we have to decide: Does Star Trek's television legacy stand up to Star Wars still going strong in the film arena? As always, you get to pick what counts in your decision — prequels, sequels, what have you. Voting closes at midnight tonight.